Nostalgia used to be considered a depressive illness; a pathological inability to live in the present. The Swiss doctor who coined the term in 1688 referred to the condition as a “neurological disease of essentially demonic cause.” But what was once deemed unstable is now one of the default modes of existing in the world. In 2016, you can go to the movie theatre and watch a feminist reboot of Ghostbusters, or Teenage Mutant Ninja Turtles: Out of the Shadows, where everybody’s favourite anthropomorphic crime-fighting turtles get a CGI makeover and emerge looking like Ralph Fiennes as Voldemort if he were jacked up on anabolic steroids. You can pick up where the X-Files left off fourteen years ago, or wait with baited breath for the Twin Peaks revival set to air in 2017. And now, you can read a brand-new book analysing the cultural legacy of My So-Called Life. In In My Humble Opinion, Soraya Roberts charts the creation of the now-canon TV show as well as the character development of beloved Angela Chase, Rayanne Graff, Rickie Vasquez and Brian Krakow. Roberts is best known for her epic dives into the legacy of icons like Winona Ryder and John Hughes, but while her longform stories are rich in detail and thoughtful yet incisive in their treatment of the subjects, In My Humble Opinion doesn’t quite reach the calibre of her former work. It’s a slim tome, readable in an afternoon, with an impact that fades quickly after. As is, the book is a pastiche of existing literature, interviews with creators and wandering exposition that coagulates into a not-entirely-necessary treatise on the show. But it’s hardly Roberts’ fault the book falls short. Fans of My So-Called Life (including myself) are stubborn and hard to win over; they don’t necessarily need a journalist to explain to them why the TV show matters. Everyone who grew up idolizing Angela Chase is already more than aware of the breadth of its impact because they carry it with them every day. Perhaps a more genuine way to gauge the show’s impact would be to start by talking to the people it affected most. I started watching the show quite simply because I was obsessed with some nebulous concept of “the ‘90s,” and was curious to see what actual teenagers in the era were wearing compared to my thrift store pastiche of Doc Martens, high waisted jeans and sunflower dresses. What I found was not just wardrobe inspiration but essentially a soulmate in the form of TV. The main primetime show of my generation’s era was The O.C., which I could never get into because Mischa Barton’s acting was like a watching a marionette deliver lines. In contrast, Claire Danes displays a disturbingly precocious acting ability. She approaches the world gingerly, as if every motion is a source of great pain; slinking away and folding in on herself, as if the easiest way to avoid the pain is to disappear. 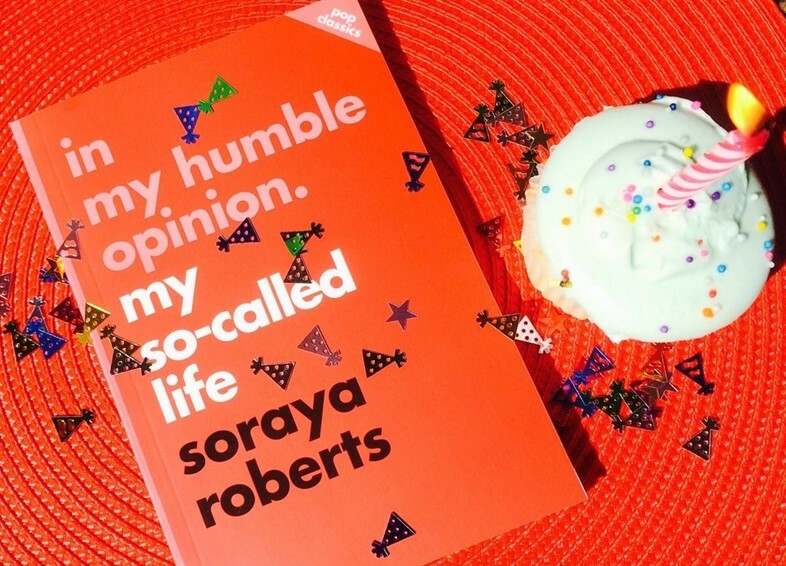 Soraya Roberts grew up harbouring an outsize obsession with My So-Called Life. “In a certain sense there are things we get exposed to when we’re younger and because of that time period, because of the age, our senses are more heightened and things have more of an effect,” she says. Roberts was the same age as Claire Danes when she appeared on the TV show and constantly used the character as a yardstick to measure her worth. She remembers asking her brother multiple times whether he thought Claire Danes was prettier than her. The book ended up being dedicated to her mother “who hated the show.” When I ask why, Roberts explains that it’s probably because as a teenager she wouldn’t shut up about it. My So-Called Life is based on plumbing for identity. In the pilot episode, Angela’s new friend Rayanne Graff tells her to “look tough” for their illicit plans to sneak into a nightclub. When Angela runs into her neighbour Brian Krakow, he makes fun of her newfound look, and she screams back, “Everyone’s an act, including you.” The show was also forward in its portrayal of smart women falling for garbage men. Angela is inexplicably attracted to Jordan Catalano, the functionally illiterate and emotionally stunted class hunk. But his soulful eyes and impeccable lean outweigh his flaws, and Angela finds his crass sort of helplessness irresistible. Every single person on the show has difficulties adjusting to their socially prescribed roles, and it was one of the first prime-time coming-of-age shows to reflect that. Happy Days reeked of artificial nostalgia, while Degrassi felt like a cautionary tale of what happens when you don’t pay attention in health class. Instead, My So-Called Life demonstrated that actions have consequences, without ever feeling prescriptive. So why can’t we can’t let go of My So-Called Life? Because it’s a show that depicts the inner emotional life of teenagers with sensitivity and aplomb. Reading quotation passages from old Vanity Fair interviews with Claire Danes doesn’t even begin to illuminate the impact that the show had –and continues to have – on teens who grow up angsty and confused. It’s unlikely that there’ll ever be a book about My So-Called Life that beats re-watching old episodes, so go ahead and indulge your nostalgia.